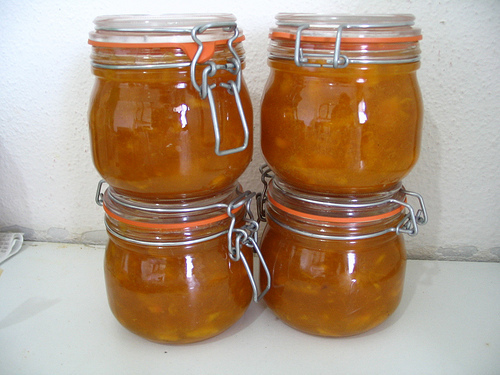 Mango jam is a sugar concentrated product similar to jelly. Both the green and ripe mangoes can be used or making jam. Making homemade mango jam is a good business idea for anyone. It can be a good source of additional income if you know how to market the product. You can sell it to your friends, neighbors, offices, restaurants, food shops and even during food bazaar events. 1. Wash mangoes thoroughly to remove dirt. 3. Scoop the flesh using a spoon. 4. Scrape the pulp from the seeds using a knife. Mash with a fork. Measure. 5. Add an equal amount of sugar. Mix well. 7. Add 0.3% citric acid (1 and 1/2 tsp. for over 4 and 1/4 cups of mango pulp) when almost thick. 8. Continue cooking until temperature reaches 105oC. 9. Pour hot jam in sterilized jars and leave 1/4 inch head space. Department of Science and Technology. Basic Methods in Mango Processing. I am interested to learn but where I can buy citric acid to make mango jam? how much is a kl? can anyone out there tell me how much a KL is My mangos are ripe! how many kilos of mango jam would this recipe make?